The University of Massachusetts Amherst (UMass Amherst) is working with the MA Department of Environmental Protection (MassDEP), MA Office of Coast Zone Management (MassCZM) and the Environmental Protection Agency (EPA) to develop cost-effective tools and techniques for assessment and monitoring of wetland and aquatic ecosystems. Following EPA’s three level approach to wetlands assessment and monitoring (Level 1: Landscape Level Assessment; Level 2: Rapid Assessment Methodologies; Level 3: Intensive Site Assessment) the Massachusetts program is initially focusing on levels one and three. Given that the Conservation Assessment and Prioritization System (CAPS) was already designed as a Landscape Level Assessment tool it serves as the state’s level one assessment method. Intensive assessment methodologies – called Site Level Assessment Methods or SLAMs – have been developed for salt marshes and forested wetlands. Extensive field research using these level three assessment methodologies is used to develop and test the sophisticated landscape-based assessment models that make up CAPS. The landscape-level assessment is expressed in terms of CAPS Index of Ecological Integrity (IEI) scores. These scores are available for every cell of mapped wetland in Massachusetts. The intensive Site Level Assessment Methods (SLAMs) yield scores based on Indices of Biological Integrity that are developed using the stressor gradient represented by CAPS metrics. A suite of IBI scores can be generated for any site for which an intensive assessment has been completed. The long term partnership among MassDEP, MassCZM and UMass Amherst has allowed us to use data collected by the state agencies to test and improve CAPS metrics and ecological settings variables. In turn, CAPS provides an efficient means for conducting comprehensive, statewide assessments of wetland condition (ecological integrity) as well as scenario analysis capabilities for project review, mitigation planning and ecological restoration. Intensive field assessments of salt marshes and forested wetland have produced data on a variety of biological taxa and for many sites. 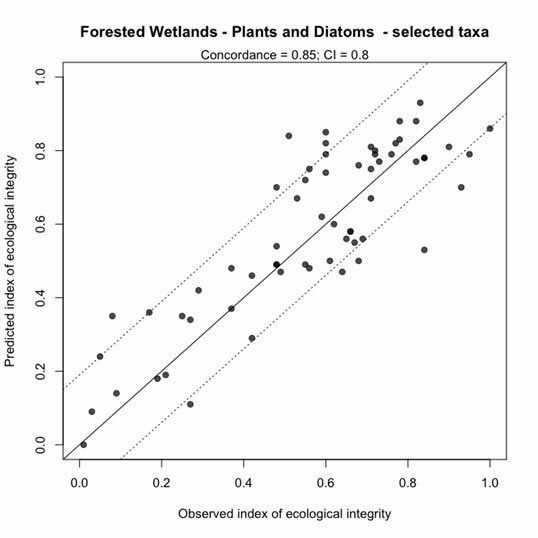 This has allowed us to use very sophisticated statistical modeling techniques to produce Indices of Biological Integrity (IBIs) for those wetlands. Our best IBIs use abundance measures for a variety of species from different taxa groups (e.g. diatoms, plants, macroinvertebrates). In addition to IBIs based on CAPS ecological integrity (IEI) models we also produce IBIs for specific metrics such as nutrient loading, road salt, road sediment, or impervious cover. We also have used aquatic invertebrate data that had been collected by MassDEP to test IBIs currently being used by the agency and develop new CAPS-based IBIs for assessing and restoring stream ecosystems. The capacity to support for fish, wildlife and biodiversity is one prominent value for which wetlands are protected by state and federal laws and regulations. Thus, aquatic life use is one aspect of wetlands that needs to be assessed and monitored to determine the effectiveness of wetlands protection programs. CAPS IEI scores are a continuous approach for defining reference conditions used in the development of Indices of Biological Integrity (IBIs). Because both IEI and the IBIs yield scores that are continuous throughout their range it is not necessary to create tiers or classes for wetlands and water bodies in order to have meaningful criteria for aquatic life use. We call this new approach CALU for Continuous Aquatic Life Use standards. The CALU approach is based on the relationship between IEI (representing the constraints on biological condition due to the nature of the surrounding landscape) and IBI, which represents the actual condition of a site based on assessments conducted in the field. By defining an acceptable range of variability around this relationship it is possible to create numeric criteria for biological condition (a range of acceptable IBI scores) based on each site’s particular landscape context (IEI score). The CALU approach provides a rigorous and quantitative system for establishing criteria for aquatic life use that avoids undesirable effects from cutting up a continuous environmental gradient into discrete classes or tiers. Using the relationship between IEI and IBI scores to define an acceptable range of variability for wetland biological condition. The result of this work will be a comprehensive wetlands monitoring and assessment program for Massachusetts that will guide policy decisions and restoration efforts. The partners in this endeavor expect to use the program to evaluate wetland condition, avoid/reduce impacts of development on the wetlands, better focus and evaluate mitigation projects, and improve wetland conditions statewide through targeted restoration projects. The following are components of the comprehensive wetlands assessment and monitoring program for Massachusetts developed by MassDEP, MassCZM and UMass Amherst. Use of CAPS as a Level 1 (Landscape-based) assessment of wetland condition. Development of new metrics for use in CAPS including: tidal restrictions, salt marsh ditching, hardened coastal structures, beach pedestrian traffic, ORV traffic, boat traffic intensity, flow alteration, water temperature alteration, nitrogen enrichment, and phosphorus enrichment. This project has been financed partially with Federal Funds from the Environmental Protection Agency (EPA) to the Massachusetts Department of Environmental Protection (the Department) under an American Recovery and Reinvestment Act of 2009 Section 604(b) Water Quality Management Planning Grant. Additional funding has come from the Wetland Program Development Grant Program administered by the U.S. Environmental Protection Agency under section 104 (b)(3) of the U.S. Clean Water Act. The contents do not necessarily reflect the views and policies of EPA or of the Department, nor does the mention of trade names or commercial products constitute endorsement or recommendation for use.